Factory Entertainment has just unveiled their 1st of many San Diego Comic-Con 2018 exclusives! Check out the SDCC 2018 Exclusive Justice League Batman Metal Miniature. Weighing in at a substantial 11 ounces, the San Diego Comic-Con 2018 Exclusive Batman Heavy Metals Miniature features Gotham City's Caped Crusader brooding and ready to attack all foes and save the day in more ways than one! 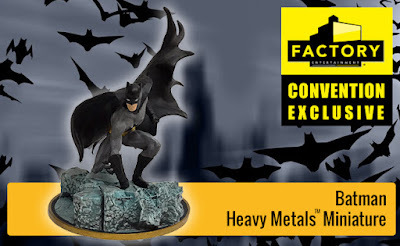 This heavyweight collector grade 1:32 scale solid metal collectible features a highly-detailed finish and was spun cast in small batches and hand-painted to exacting standards, perfect for any discerning collector. 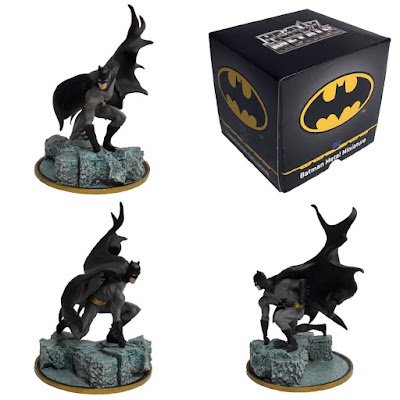 The San Diego Comic-Con 2018 Exclusive Justice League New 52 Batman Metal Miniature can be pre-ordered now at the Factory Entertainment online store for $40 for either pick up at their SDCC booth #2647 or for shipment after the convention.